President Duterte has urged voters to support the five senatorial candidates of the ruling PDP-Laban party. 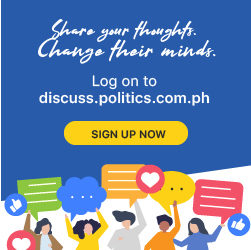 Duterte, chairman of the administration party, appeared in the latest campaign ad of senatorial bets Senator Aquilino Pimentel III, former MMDA chair Francis Tolentino, Maguindanao Rep. Zajid Mangudadatu, former presidential aide Christopher Go, and former police chief Ronald dela Rosa. The five candidates are also included in the personal slate of the President. “Ang tutulong sa atin at kakampi ko — ang PDP-Laban. Ang partido ko. Tulungan ninyo sila. Salamat po,” the President said. Thank you President Rodrigo Duterte for endorsing your PDP Laban Senatorial Candidates – Cong. Dong MAngudadatu, former PNP Chief Ronald “BAto” Dela Rosa, former SAP Bong GO, Senator KOko Pimentel, and former Secretary Francis TOlentino.